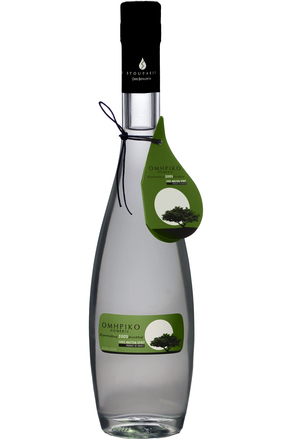 Mastiha, pronounced 'mahs-TEE-ha' and variously spelt Masticha, Mastichato Chiou, Chios Masticha is a Greek liqueur flavoured with mastic, a semi-transparent resinous sap gathered from the evergreen Lentisk bush, although it can also apply to a strong spirit similar to ouzo or tsikoudia. The Lentisk (Pistacia lentiscus) is also known simply as the mastic bush, skhinos in Greek or Lentisk in English and is a distant relation to the pistachio tree. While the shrub grows elsewhere in the Mediterranean it only sheds resinous 'tears' on the island of Chios (Greek spelling Xios), birthplace of the poet Homer. 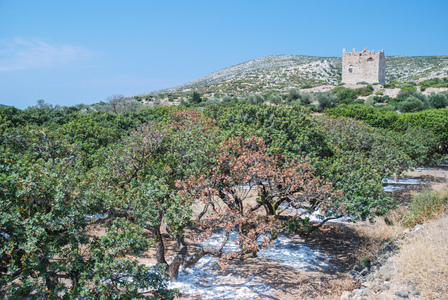 The inhabitants of around thirty Mastic villages or Mastichochoria (Μαστιχοχώρια) at the southern end of the island cultivate the tree and harvest mastic. Undersea volcanoes in the Aegean Sea which affect the local climate, coupled with the volcanic red soil which is particular to the island are thought to cause the Lentisk on Chios to produce their famous mastic tears. The production of mastic is historically and continues to be controlled by the Mastichochoria monopoly which has 24 branches controlling some 2 million mastic trees. Mastic resin is the original chewing gum and its use is documented in parchments dating back to the 5th Century B.C. The ancient Greeks chewed mastic for fresh breath, as did the Romans, Byzantine Greeks and later the Venetians, Genoese and the Ottoman Turks. The word mastiha is also widely used in neighbouring countries of the southern Balkans for anise-flavoured liqueurs. The name is derived from the ancient Greek verb 'mastikhein' (Greek: μαστίχα), to chew and the English word 'masticate' shares the same origins. Mastic resin is thought to help heal peptic ulcers and mastic oil, which contains perillyl alcohol is believed to be effective in both the prevention and treatment of some forms of cancer. The mastic harvest or 'kendos' starts in June and continues through to September. This labour intensive process requires the ground beneath each mastic bush to be cleared and a layer of fine white clay sand spread around the base of each shrub. A number of incisions are made into the stem and larger branches with tool known as a 'kentitiri'. The mastic resin oozes from these incisions and coagulates into crystallised resin 'tears' which drop, or are scraped off and land on the surface of the white sand below from where they are collected, cleaned and sorted according to grades of purity depending upon content of tree bark, leaves or other detritus. 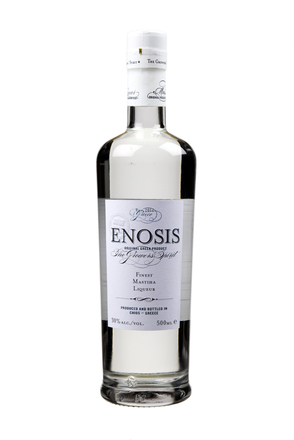 In Greece Mastiha is served chilled or at room temperature, but is most commonly poured from the shelf over ice. It tends to be served with meze appetizers such as octopus, calamari, fried zucchini, clams and such like but can also accompany desserts, particularly those made with almonds or simply drunk as a digestive. Mastiha with: Mint, gin, birch water and peppermint bitters. Mastiha with: Vodka, cranberry juice and lime juice. Mastiha with: Scotch whisky, Islay single malt, birch water and liquorice bitters. Mastiha with: Basil leaves, light white rum, lemon juice and sugar syrup. Mastiha with: Light white rum, lime juice and birch water. Mastiha with: English cucumber, gin, lemon juice, sugar syrup and Angostura bitters. Mastiha with: Gin, triple sec, lemon juice, peppermint bitters and egg white. Mastiha with: Gin and celery juice. Mastiha with: Gin, dry vermouth and ouzo. 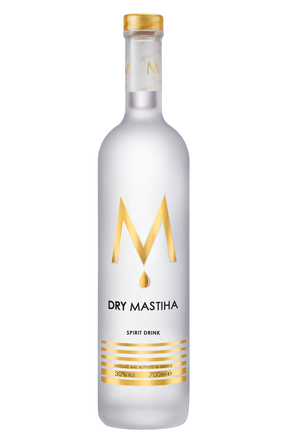 Mastiha with: Prosecco and soda. Mastiha with: Gin, Green Chartreuse and lime juice. Mastiha with: Mint, light white rum and lime juice. Mastiha with: Lemon juice, sugar syrup and egg white. Mastiha with: Lemon juice, sugar syrup, Angostura bitters and egg white. Mastiha with: Gin, cranberry juice, white crème de menthe and peppermint bitters. Mastiha with: Pink peppercorns, vodka, lemon juice, sugar syrup and Peychaud's bitters. Mastiha with: Mezcal, pink grapefruit juice and sugar syrup. Mastiha with: Bianco vermouth, Fernet Branca and celery bitters. Mastiha with: Basil leaves, lemon juice, sugar syrup and soda water. Mastiha with: Mint leaves, Scotch whisky, sweet vermouth and orange juice. Mastiha with: Mint leaves, vodka, birch water, fino sherry and peppermint bitters. View all Mastiha cocktails on Difford's Guide.